Almost three weeks after a no-confidence vote that rocked the country, a joint statement from the Government and Opposition has shown a sharp division on how parliament would function. The statement yesterday would come after President David Granger led a team to a meeting with Opposition Leader, Bharrat Jagdeo, at the Ministry of the Presidency on Wednesday. Along with the President were Prime Minister, Moses Nagamootoo; Vice President, Carl Greenidge; Vice President, Khemraj Ramjattan; Attorney General, Basil Williams; Minister of State; Joseph Harmon; Minister of Natural Resources, Raphael Trotman and Minister of Social Cohesion, Amna Ally. For the Opposition team, Jagdeo was accompanied by Gail Teixeira; Anil Nandlall; Irfaan Ali; Juan Edghill; Dr. Frank Anthony; Pauline Sukhai and Odinga Lumumba. On Wednesday, following the meeting, there were separate statements from both sides. There was a promise of a joint statement. Yesterday, the joint statement made it clear that while Government and the Opposition were unified on the territorial integrity of the country, there were differences. Public Services; Public Order and the Dissolution of Parliament. Operational readiness of GECOM; national registration and Public Information. 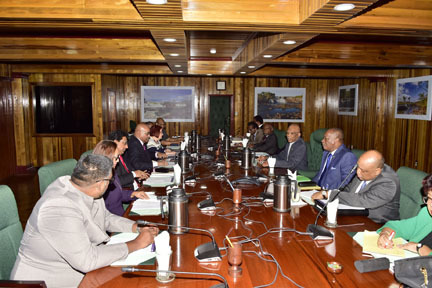 During the talks, Jagdeo insisted that the “no confidence motion” was validly passed and therefore there must be compliance with Articles 106 (6) and 106 (7) of the Constitution. He further stated that the timeframes prescribed by the two provisions of the Constitution must be rigidly observed, notwithstanding the pendency of the legal proceedings filed; and that Parliament must be dissolved unless otherwise agreed upon in accordance with Article 106 (7) of the Constitution. On the other hand, President Granger emphasized that the Government is legal and that it must govern without any limitations on its authority. According to the joint statement, the President further stated that it is lawful for the Government to engage the Court, to bring clarity to the provisions of Article 106 (6) and 106 (7) of the Constitution. “Pending the conclusion of the legal proceedings, Parliament remains functional. Both sides are committed to work towards the expeditious conclusion of the matters engaging the attention of the court. On December 21, last, Government MP, Charrandass Persaud, joined with the Opposition in voting yes on a no-confidence motion brought by Jagdeo against the three and half-year-old government. The vote was deemed carried by the Speaker but Government went to court questioning the validity of it. Persaud who was expelled by his party, the Alliance For Change flew out of Guyana the same night and was accused by officials of taking a bribe for his vote. The police are said to be investigating. Under the Constitution, elections have to be called within three months and the government has to resign.